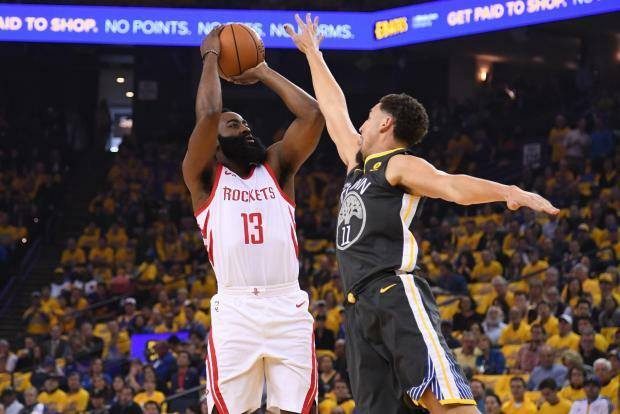 Eric Gordon's first 3-pointer of the game gave Houston a late five-point lead, and the Rockets held on from there to defeat the Golden State Warriors 95-92 in Oakland, Calif., on Tuesday night to even the Western Conference finals at two games apiece. James Harden scored 30 points and Chris Paul 27 for the Rockets, who regained home-court advantage in the best-of-seven series that returns to Houston for Game 5 on Thursday night. Stephen Curry had 28 points and Kevin Durant 27 for the Warriors, who had their NBA-record, 16-game home playoff winning streak snapped. The victory was the Rockets' first on the road against Golden State in the playoffs in franchise history. In a see-saw affair in which both teams led by double figures, the Rockets got the better of the finish after Curry converted a three-point play to get the Warriors within 91-89 with 3:18 to go. After Harden and Curry traded missed 3-point attempts, Gordon, who was 0-for-6 from beyond the arc to that point, buried a 27-footer for a five-point cushion with just 2:25 to play. The Warriors got back within 94-92 and had possession of the ball in the final seconds, but Klay Thompson misfired on a heavily pressured 16-footer. Paul, fouled on the rebound, made one of two free throws with a half-second remaining to make it a three-point game, and the Rockets then sweated out a missed desperation 3-point try by Curry at the final horn. Harden hit 11 of his 26 shots and Paul 10 of his 20 for the Rockets, who have won four of six road games in the postseason. Gordon finished with 14 points while PJ Tucker contributed 16 rebounds and Clint Capela had 13 boards for Houston, which has rebounded from all four losses this postseason with a win. Durant hit just nine of his 24 shots and Curry 10 of his 26 for the Warriors, who had been 4-0 in Game 4s during the Steve Kerr era when up 2-1 in a series. Draymond Green recorded an 11-point, 13-rebound double-double while Thompson chipped in with 10 points for the Warriors, who played without Andre Iguodala, sidelined due to a sore left knee. Both teams made big runs in the first half, with the Rockets' lasting longer and producing a 53-46 halftime lead. With all five starters scoring, the Warriors put up the game's first 12 points, holding the Rockets scoreless on 0-for-8 shooting for more than five minutes. However, the Rockets got much the better of the rest of the half, outscoring Golden State 53-34 to build the seven-point edge. Harden had 15 of his 30 points in the second quarter, during which the Rockets went up by as many as 10.